A notably fleshy Richard Dreyfuss, now 68, has let himself grow into the role of the world’s most notorious, pear-shaped Ponzi schemer. 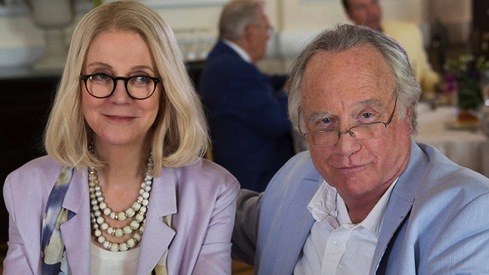 Very ably assisted by Blythe Danner as his wife, Ruth, Dreyfuss inhabits Bernie Madoff without vanity and with considerable impact in ABC’s two-part, four-hour Madoff. It’s a white collar true crime story that almost assuredly will have no appeal whatsoever for younger viewers. Which makes it an odd fit for today’s ABC and probably better suited as an “event miniseries” on HBO or basic cable’s History or National Geo networks. But ABC it is, and there’s at least a solid chance for some acting Emmys even if the ratings go into the red. Dreyfuss is all over this role, whether narrating, chortling or going nearly mad as the stock market collapse of 2008 closes in on him and the many investors he’s bilked. “As long as deposits out-pace withdrawals, you can live like a king,” Dreyfuss as Madoff says in Wednesday’s opening minutes. Directed by Raymond De Felitta (City Island), this tale of excesses come home to roost carries the standard “Inspired by true events” disclaimer. Viewers also are informed that “some characters, businesses, scenes and chronologies have been invented, altered or consolidated for dramatic purposes.” But if you break into any patches of disbelief, it’s too late to call a script doctor. Otherwise, a typical weekend at Bernie’s includes sumptuous family dinners at his posh oceanside home. The self-described financial “magician” is usually joined by wife Ruth, their sons, Mark and Andrew (Tom Lipinski, Danny Deferrari) and Bernie’s jittery younger brother, Peter (Peter Scolari), who also serves as his chief compliance officer. But the true second lieutenant is Frank DiPascali (Michael Rispoli from The Sopranos), who runs a secret 17th floor office and is a fully complicit co-conspirator. The drama strongly suggests that Ruth, Mark and Andrew were totally in the dark while an increasingly guilty Peter mostly looked the other way. Unfortunately, Grodin’s role amounts to perhaps two minutes of screen time, with ranting comedian Lewis Black likewise very little seen as another greedy investor. This leaves Dreyfuss with lots to do from start to stop. And his performance is worth the price of his eventual grudging admissions. He still has the chops, as does Danner as a dutiful wife who sometimes chafes but enjoys the creature comforts her husband has provided them. But alas, the Madoff family can’t quite seem to kick the cancer gene, which is sometimes used as a rather heavy-handed metaphor for rotting from within. One and all of course watch ABC News for the latest on the escalating stock market and investment company meltdowns. This allows the network to trot out news footage featuring the likes of Charles Gibson, George Stephanopoulos, Diane Sawyer, Brian Ross and Terry Moran. In the end, Bernie Madoff is depicted as a fall-on-his-sword criminal who wanted to shield his family and Di Pascali from prosecution but had no regrets about bilking thousands of investors large and small. After all, he reasons, they were gladly part of the process during all of those happy returns. Madoff remains incarcerated, with a release date of 2139 that he’s not likely to see. Assuming they have ABC on the prison TV menu, perhaps he’ll enjoy watching Dreyfuss play him to the hilt. It’s a juicy part for an aging actor who’s likewise fortunate to have the always good Danner along for the ride. Together they make Madoff a watchable yet curious undertaking for a network that would rather be the broadcast home of Marvel action heroes but still can’t seem to make those particular investments pay off.